Possibility of a no-deal Brexit has sent activity in the manufacturing sector to a 13-month high in March, according to a major survey. Firms hoarded raw materials and finished goods at the fastest monthly rate of any G7 country since 1992 amid concerns that imports and exports will be held up at the UK border. IHS Markit purchasing managers' index (PMI) jumped to 55.1, the highest since February last year, with output, employment and new orders all rising at increased rates as manufacturers and their clients raced to cram "buffer stocks" into their warehouses. Rise in UK output contrasted with a miserable month across the eurozone, which remained surrounded in recession after conditions deteriorated at the fastest rate in six years. Germany dragged down the eurozone PMI after falling to 44.1, an 80-month low. Italy too fell, along with France, which tagged along the 50 mark that separates contraction from expansion. There was one optimistic note for European manufacturers when surprise increase in China's output pushed the PMI for the world's second-largest economy to 50.8 Shares in London-listed mining companies nudged higher on the news and metal trading firm Glencore also benefited, while in Frankfurt the DAX rose 1.16 per cent as traders became more optimistic about the sales of German cars and industrial equipment to China. 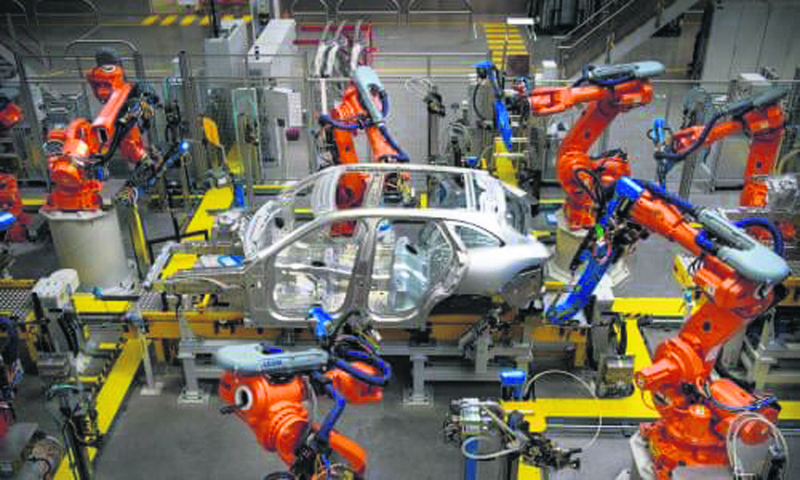 Director at IHS Markit, Rob Dobson said the jump in UK manufacturing activity was directly linked to firms stepping up their preparations for potential Brexit-related disruptions. However, he warned, "The stock-building boost introduces a major headwind for demand, output and jobs growth moving forward. Manufacturers are already reporting concerns that future trends could be constrained as inventory positions across the economy are unwound." He added, "The survey is also picking up signs that EU companies are switching away from sourcing inputs from UK firms as Brexit approaches. It looks as if the impact of Brexit preparations, and any missed opportunities and investments during this sustained period of uncertainty, will reverberate through the manufacturing sector for some time to come." Consultancy Capital Economics said its analysts were more circumspect about the impact of stockpiling. It said, "We would warn against concluding that stock building is significantly supporting overall economic growth given there is little evidence of that in other figures such as imports. And even if it was, it would only be a temporary boost to activity. Nonetheless, considering the industrial contraction in the eurozone, UK manufacturing appears to be coping well."